Grave ref. : XXIII. E. 3. William Wood Gibbins was born in Belgrave, Leicester in 1886 son of William Gibbins a boot maker/riveter born Eynsham, Oxfordshire and his wife Elizabeth born Leicester. William had brothers and sisters John George, Jane E., Lydia Ann, Elsie and Cecil Harold. In 1901 the family was living at St. Saviour’s Street, Leicester and William, aged 16, was employed as a grocer’s assistant. His father’s boot making business was doing well and wife Elizabeth and daughter Jane are also both working from home as machinists. In January 1903 William, aged 16 years and 3 months, joined the Royal Navy. At the time he was 5′ 0″ tall, with brown hair, hazel eyes, a fresh complexion and a scar on the left side of his forehead. He trained at HMS Ganges and was promoted to Ordinary Seaman on his 18th birthday. He was mostly shore-based, interspersed with sea trips aboard HMS Royal Oak and the Kaiser. His trade is given as a tailor, so perhaps he was involved with the making of uniforms at training establishments. But, for some unknown reason, navy life was not for William and he ran away twice, deserting in April 1908 to be recovered a few weeks later and sentenced to 42 days hard labour. In December1910, William had scarpered again, evading capture until April 1911, by which time the Royal Navy had decided he should not be claimed back for further service. His conduct was regarded as generally ‘Class II’ changing from very good, good or fair as the mood took him. Although William had signed up for 12 years’ service, he actually only did nearly 8 years in the navy. William moved to the Jacksdale area some time later as the ‘Soldier Died’ listings record his place of residence as Jacksdale, possibly living at 16, Main Road. In 1912 William married Martha (nee Kirby) who had been born at Westwood in 1893. In 1901 Martha was living with her parents at Laverick Road, Jacksdale and in 1911 was living at Clarendon Street, Nottingham, a domestic servant to the Gill family. William and Martha had a daughter named Edna Mabel. The ‘Selston Roll of Honour’ published in the ‘Free Press’ in early 1917, reports that William Gibbins enlisted at Cardiff in September 1914. The 8th Royal Munsters were raised in September 1914. Training took place at Buttevant, Fermoy, Mitchelstown, Kilworth Camp, Templemore and Fermoy, moving to Dettingen Barracks, Blackdown in August 1915. It was from Blackdown that the Regiment boarded troop trains en-route for Southampton, sailing for France at 6 pm on 17th December 1915, on the ‘Empress Queen’. She was the largest and fastest paddle steamer ever built and in 1903 was the first vessel to be fitted with wireless telegraphy. 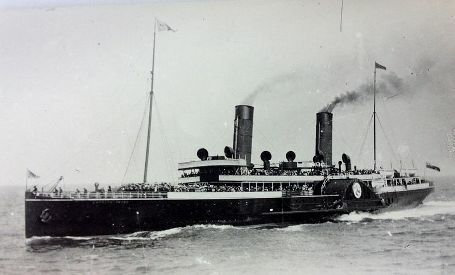 Owned by the Isle of Man Steam Packet Company she had been chartered by the Admiralty to serve as a troopship in 1915. William was surely aboard as his Medal Rolls Index Card confirms that he entered the French ‘theatre of war’ on 17th December 1915. The Battalion disembarked at Le Havre, travelled by train to Fauquerie, and marched, on the 19th December 1915, to Verquin where they were billeted. They sustained their first loss on Christmas Eve, when Second-Lieutenant PS MacMahon was hit by a stray bullet, whilst supervising a trench working party. By January 1916, they were on duty on the Loos Front. In May 1916, they found themselves being ridiculed by the Germans who, having heard about the Easter Rising in Dublin, had raised large placards in their trenches, clearly visible to the Battalion, one of which read: “Irishmen! Heavy uproar in Ireland. English guns are firing at your wives and children!” The placard was captured by one Lt. Biggane and his men, on 10th May and later presented to His Majesty King George V, who applauded their loyalty and gallantry. It has not been possible to locate Sgt Gibbins’ service record but it would appear that he attained the rank of Sgt, fairly rapidly, with only two years service to his name. 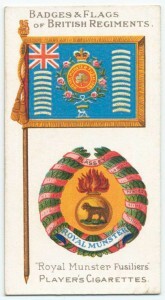 In 1881, during Lord Cardwell’s ‘Military Reform of The Army’ the old numerical regimental designations were re-organised into territories corresponding to the locality with which they were connected. The Royal Munsters took their name from the Irish Province of Munster, embracing the counties of Kerry, Cork, Limerick and Clare. Their main depot was situated at the Tralee Barracks, County Kerry. In peacetime a regiment might have perhaps only two battalions, but during WW1, the Royal Munsters had nine battalions in service. William Gibbins was serving in this so called ‘New Army’ as a volunteer in the 8th Battalion. In the Times Newspaper, dated 25th July 1916, Sgt. W Gibbins 978 is listed among the wounded. The date of injury is not known as there would have been a delay in publishing the information in the paper. The full Roll of Honour for that week listed 3,600 Commonwealth troops who had been wounded, killed or died. Sgt. Gibbins is listed along with 39 Munster Fusilier Casualties, 37 wounded and 2 killed in action. It seems that he was soon well enough to return to active service. Just a few months later, on Sunday 3rd September 1916 William Wood Gibbins was killed in action, in France. Information from the Royal Munster’s Regimental Historian suggests that he may have been killed during the attack at Guillemont, as the Munsters sustained 265 casualties during that attack. His name appears on the Roll of Honour ‘Losses in the Ranks’ published in the Times on 17th October 1916. 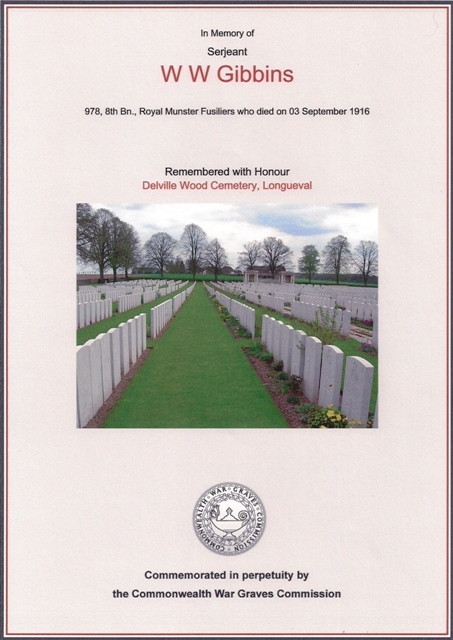 There is also an entry for him on page 277 in a book entitled ‘Ireland’s Memorial Records 1914 to 1918’. Only a few months after his death, on 23rd November 1916, the 8th Royal Munster Fusiliers, suffering diminishing numbers, were absorbed into the 1st Battalion Royal Munster Fusiliers. 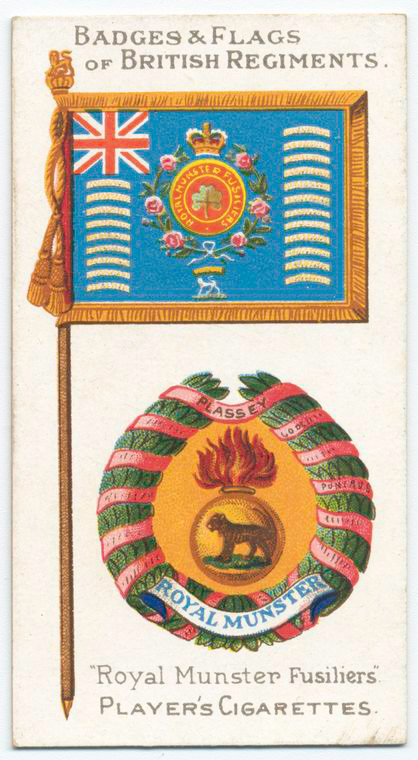 The Royal Munster Fusiliers were disbanded in 1922. Sgt. Gibbins is buried at Delville Wood Cemetery, Longueval, Somme. There are 5,523 soldiers of all nationalities commemorated here, of which, 3,593 are unidentified. The Cemetery was created after the Armistice and almost all of those commemorated fell between July and September 1916. Sgt. Gibbins was a recipient of the 1914-15 Star, the British War and Victory Medals. His daughter Edna was aged only 3 when her father was killed in action. His widow Martha re-married after his death, taking Edna to live in Stapleford, Notts. Edna went on to marry Ernest Hind in 1938. 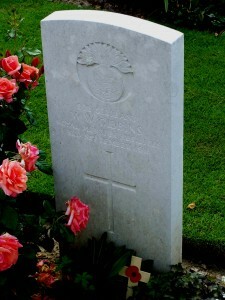 There is a discrepancy in the spelling of this serviceman’s name, being recorded as ‘Gibbons’ on the Jacksdale War Memorial and in The Free Press, but recorded as ‘Gibbins’ in the Regiment Casualty lists, Medal Rolls Index and ‘The Soldiers Died in the Great War’ lists, as well as his birth and marriage records. Special thanks go to James. F. O’Sullivan, Royal Munster Fusilier’s historian, now resident in Brisbane, Australia, who has provided much of the above information. Recommended Reading: “The History of the Royal Munster Fusiliers.Volume II, 1861- 1922″ by Captain S. McCance, published 1927. Printed by Gale & Polden Ltd., Aldershot. Read the latest copy of Badjer News by clicking on the link below. You can also download back issues. The official Kyle Ryde website – news on his racing achievements this season. Find out all about forthcoming events in Jacksdale and Westwood and surrounding areas. If you have an event planned please let us know so we can advertise it on the site.